The Europeans do it differently! Saturday dawned bright and very early and very slightly snowy. But I grew up in the hills and microns of snow won’t stop me and I set out for (what turned out to be a Rogers and Hammerstein “Beautiful Morning”) Purlescence to do a Continental Knitting and Norwegian Purl workshop with Anniken Annis. The universe (and specifically Transport for London) had other plans. Having closed, but not updated their website, I found myself at Victoria with no circle line, no useful district line, no bakerloo line… basically the whole of zone 1 was unusable to get to Paddington. Of course my 20 minute cushion vanished in the face of going via Hammersmith (including a 10 minute delay at Earl’s Court, because, ironically, the train was ahead of schedule) and I arrived at Paddington to watch the train pull out. I *hate* being late. Me: I want to get to Didcot Parkway, I think the next train is 8.57am. Can you let me know what time it gets there? Me: [brain going clunk] sorry? a train that leaves more than 30 minutes later gets in earlier? Information: Yeap, by 15 minutes. Me: How? Oh, never mind. so, having established that I had over an hour to kill (and HUGE thanks go to J of Purlescence for coming and saving me from the station) I thought I’d grab breakfast in the form of a bacon & sausage roll. I found the only reverse microwave in the world – hot bread, lukewarm sausage and bacon and stone cold tomato sauce which was in the middle of everything. Blah. Finally I managed to get to the class, where I wasn’t snubbed by the class for being late (thank you ladies) and I hadn’t missed too much so was able to catch up. Despite being able to crochet with both hands, I’ve never mastered knitting continental style. 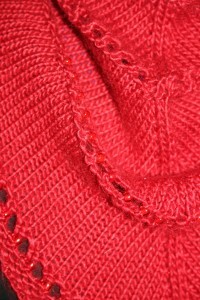 I can ‘pick’ when I knit backwards, but never ‘got’ it normally. I made a mistake in grabbing my signature needles, you definitely need a slightly grabby needle to make this easier. I still wouldn’t claim I’ve *mastered* it, but I am a lot better than I was, and I (strangely) found purling easier than knitting. We picked up some great tips for long tail cast on and had conversations that ranged from cable needles to slankets. My tensioning is still a bit, erm, random at best. I am far too tense when holding my needles but I have made a start and I have a half inch of a basketweave cowl to practice with. Naturally I picked up a couple of bits in the shop during lunch (some of which has been put to one side for giftmas presents. The journey home was *much* smoother and enjoyable – but the day couldn’t leave without one last ‘nudge’ and it took me 1hour and 40minutes to get pizza delivered from 1/2 mile away. This week will be a week of posts, as tomorrow I am off to my favourite LYS, Purlescence, to do a workshop on Continental Knitting and Norwegian purl! So I’ll write about that soon. However, right now I want to update on a couple of other things. First, in this post I want to let you know what I’ve been upto. Plugging away slowly I have managed to finish a crochet shawl, and a knit shawl and start on another small project. 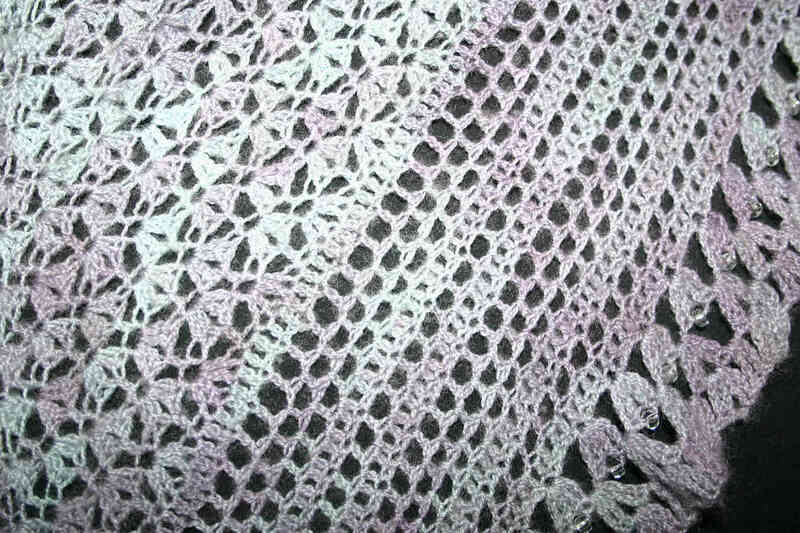 First up I finished my recuerdos de la niebla shawl. This seemed to take forever, as I am used to crocheting much faster than my hands currently let me. That and the never ending ball of yarn. Seriously, the pattern said use about 50% before starting the border. I used 75%. 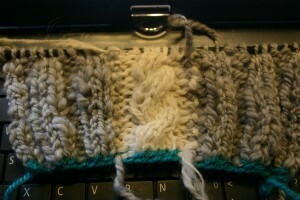 Then I did three rows of border. You are supposed to get 7 rows of border total, so I weighed how much I used in row 4 – 4grams – and I had 23 grams left. 20/4 is 5 rows plus a little bit left over. I got 11 rows. And another 2 rows of SC across the top edge before giving up with another 4grms of yarn left. Not entirely sure how that works, but that is why my beads aren’t on the last row of the edging, but 2 rows in. I think it worked out pretty well! After that marathon, and my hands being a pain, I wanted a project that was quick, that was knit and that used up some of the yarn that I had been gifted in the last 12 months. After lots of fussing and indecision I went with the beautiful ‘the age of brass and steam kerchief’ (a free pattern on Ravelry), done in the gorgeous DK weight Debbie Bliss Andes. I had been gifted 2 skiens last year for my birthday in a lovely deep, dark red. 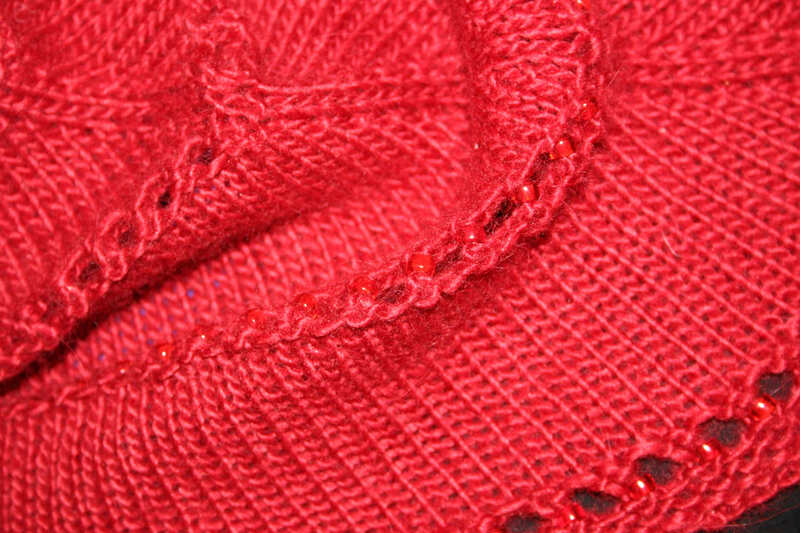 The beaded sections were a bit of pain (literally) but easy enough – particularly if you decide to knit together and *then* bead the resulting stitch. My first beaded row I tried a pass2, pass 1 over, bead the stitch and then knit it. It worked, but not as well. Once blocked the yarn bloomed slightly, softened even more and is just the right size to sit in the V of a coat and give lovely warmth. The yarn has lovely stitch definition as well, and it was such a joy to work with I picked up some more in chocolate at the Ally Pally show. Delighted with having a ‘fast’ project (a little under two weeks all told) I wanted another one. I have some gorgeous yarn staring at me, and a hankering for some cabled fingerless mitts, but I’m not quite there yet, so instead I broke out another gift. I was given some beautiful handspun last July, and have been dreaming of the perfect project. 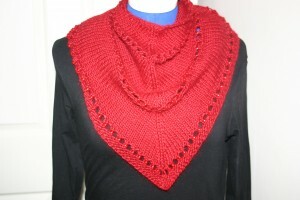 I wanted something that I could use both yarns together, and something that would show off the yarn. 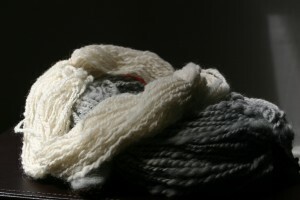 The grey is a thicker, bulky type weight and the cream a much finer closer to 4ply weight. A pair of 6mm needles, and a bit of ‘constructive swatching’ (known to others as ‘that’s not right, I’ll start again’) I’ve started a cowl. 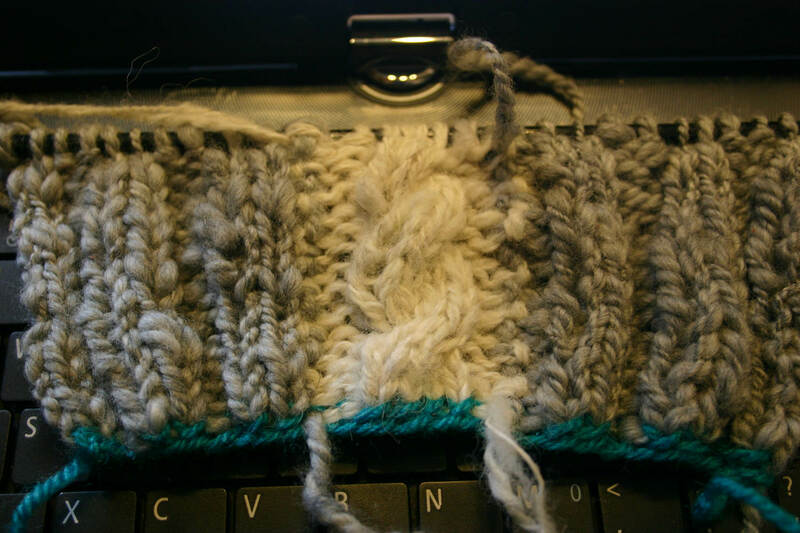 I’m doubling the cream yarn to give a little weight so it’s similar to the grey, and I’ll go as long as I can before using a kitchner stitch bind off to have a seamless loop (hence the odd green bit at the bottom. 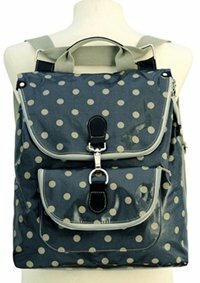 It’s lovely and soft, and has a sort of ‘rustic’ look which goes lovely with my new full length wax jacket! If this goes well I think I might look at working some cabled mitts over a longer period of time! With plan in hand, day 2 went smoother (though we didn’t get as far as room3 this time). Woman2: (glances at label) yeah, it’s *British* wool, that’s why. It really made me think about how spoilt we are now with such beautiful soft fibres like silk, mohair, alpaca etc… Though I hadn’t thought of British pure wools being any more or less ‘itchy’ than other pure wools. I also picked up several bits that have nothing to do with crafting – a gorgeous waterproof backpack from Bergs Designs (which will be perfect for walking to work over the winter months), a lovely teapot coaster that contains oat and spices that fill the room with amazing scents when the hot teapot is put on it, a fashion book, a couple of Christmas presents (shhh 😉 and lots and lots and lots of flyers and business cards. Oh, and a free mini tote from the Irish tourist board. I could have easily spent twice as much as I did but I’m happy with what I got, and my only regret is that I’m not rich enough to sit at home all day and knit pure alpaca dresses or scrumptious aran weight tunic jumpers (I have to make that at some point though). I now have lots (more) projects to add to my ever expanding list, but I can at least start on a couple of long standing ones – and I got lots of ideas for existing stash, which I am quite excited about. I know, I’m sorry. I have left you all alone for far too long. How are you? Come in, pull up a chair and I’ll put the kettle on. The status quo has been maintained on my hands, thank you for asking. Currently we are at the following: it isn’t Arthritis, it isn’t Carpel Tunnel, it isn’t any of the blood things they have tested for. It *might* be tenosynovosis in my wrists, but they are not sure, and that doesn’t tell me what is wrong with my fingers, and the next appointment is 15th November. In the meantime I am wearing splints every night – which is helping somewhat with the wrist pain. The lovely Dr who did my EMR tests for Carpel Tunnel suggested I see an osteopath as it might be something in my neck – which is interesting and I’m following that up separately. I have a whole notebook page of blog posts to go on here, but my hands have been bad enough the last few weeks that either I haven’t been able to type, or I have been able to type or craft and I’ve picked the crafting for 15 minutes instead. We seem to be coming out of the worst of it now, so maybe I’ll get some of those other blog posts written up and on here! So what has prompted this currently characteristic whittering? Yesterday I went to my first Knitting & Stitching show at the beautiful Alexandra Palace. I’ll be honest, I had no real desire to go – a mild curiosity maybe, but several friends had said in previous years it was heavy on the ‘Stitching’ in the title with lots of cross stitch and embroidery and precious little yarn. However, my mother-in-lieu (she’s not quite the Mother-in-Law yet) wanted to go, so I offered company. It worked out to be almost as cheap to buy 4 tickets as 2, so I’m going again tomorrow with another friend, and frankly, I’m glad I’ve got a second day to go at – this show is HUGE. The smallest hall contains 42 exhibitors, a ‘try your hand’ area and a fashion catwalk. The ‘mid’ hall is about twice the size again, with exhibitors and stalls of display work – some of which I didn’t ‘get’, some of which is stunning and all of which shows more creativity and skill than I possess. The ‘main’ hall is about twice the size of the medium hall and given over almost exclusively to exhibitors – and there are several workshop rooms as well, and 3 separate galleries of displayed finished work. We arrived at 10.45 (doors opened at 10) and stayed till 5pm (doors close at 5.30pm) with 20 minutes for lunch and didn’t see everything. It was a knackering day, but I’ll do my best to convey highlights and things I remember most. There may well be another post tomorrow (with photos – lots of things said ‘no photos’ but I think I’ve sussed the bits Ican photograph). The Galleries. There were 3 separate presentations. The first, as you walked through the door, was a carnival tent with unfinished projects decorating the sides (donated by members of the public). Inside the tent were the stories of FO’s. Emotive and moving it was a little sad to see some things that were a few stitches short of completion that had obviously taken hours to get that far. But it was also gratifying to know I’m not alone, and to see just how many people must have started those hexagon fabric quilts in the the 80’s! The second was a display of embroidery on the theme of ‘Gold in the Seam’ (I think) – again there were some amazing pieces with astonishing attention to detail, and some from very young crafts people (the youngest was 5!). The Exhibitors. There was an amazing mix of exhibitors – and yarn crafts were well represented with everything from £1.25 a ball acrylic to £(deep breath) Quivat. The quivat lived up to it’s reputation for being insanely soft. I can’t even begin to describe how soft that stuff was, in an 8 year old ‘demonstration’ scarf that was foisted around my neck. I think it feels how I imagined clouds to feel when I was 4. However, at £110 (yes I typed that right) for just short of 400m (50g) it’s not happening in this life time. Lots of stalls had pure breed yarns and butter soft natural fibres (thicker yarns – DK, Aran and Bulky) seem to be coming back – and cowl necks are everywhere for this season. Black Sheep Yarns caused a melee by dumping 10 skien bags of all sorts on the floor of their unit – 10 hanks of Noro for about £65, and 10 hanks of Debbie Bliss Andes for £30 anyone? Fyberspates had beautiful yarns (as always) and though I can’t afford to buy the yarn for one of the jumpers (I worked it out as £130 for the yarn) I am buying the yarn for a different one tomorrow. The Mother-in-Lieu (MIL) may have cracked at this point and bought two skiens of laceweight to make the adorable Hethe cardigan from the first Scrumptious Collection. The Little Knitting Company had some fun snowmen kits that could be made into juggling balls – and almost every stall we passed had some form of advent calendar kit.